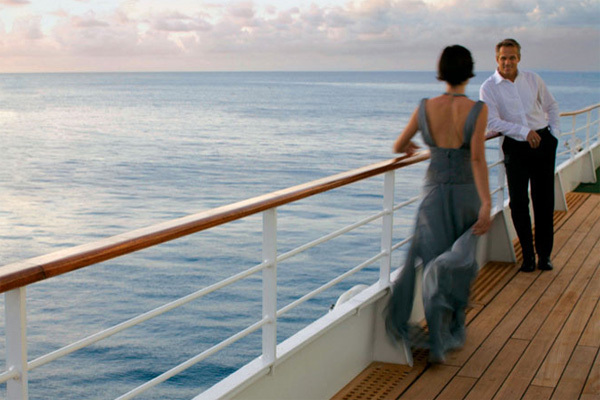 Dress codes, not all cruise lines have them but the ones that do make it pretty clear about what to wear and when. Usually you will find a mix of casual and formal although some also include semi-formal evenings and some ships don’t have any dress code at all. I believe a holiday is just that, a holiday! You have worked your fingers to the bone for months in order to enjoy two weeks of stress free adventure so the last thing you should have to panic over is what you should or should not wear. I skip many a formal evening but that’s mainly because my friend and I are more casual about cruising. We don’t always go to the main dining room or inside the ship for that matter so why should I sit in a dress when everywhere I am planning on going onboard doesn’t enforce the evening’s dress code? I am more comfortable in smart black crops and a blouse so that’s what I will wear. As I said above I am not TOO concerned however, I do think you should only be allowed in the main dining room if you are adhering to the dress code and I don’t think things like shorts and flip-flops are acceptable in the main dining room or specific bars of an evening regardless of what the dress code is. They should be kept for outside. You still need to have some level of respect if you are dining or enjoy a beverage inside the ship of an evening. What someone else is wearing has nothing to do with me or my cruise. They are entitled to make their own choices as am I. I don’t judge another human being based on what they are wearing so it shouldn’t be any different onboard ship. We are all there to enjoy ourselves and in our OWN way. For me that means skipping the odd formal night here and there, going slightly more casual and avoiding areas that I know people would prefer one be seen in suitably dressed. I actually wonder if the issue is not so much what the person is wearing but the more the fact that the individual is wearing that attire in a specific part of the ship? Recently we did a package in the USA which finished with 7 days on Carnival Dream. Having been used to sailing with Cunard, P&O and HAL I checked before leaving and discovered that it was more relaxed in dress codes so did not take any formal wear. Their “formal” nights entitled “cruise elegant” you had everything from guests smartly dressed in 3 piece suits and the ladies in long dresses to others arriving in flip flops, thirst, swim shorts and baseball caps although it said that these weren’t permitted in the dining room. It was part of a package and we had good food good weather and a comfortable cabin but I wouldn’t do it again. I’m 6 foot tall and 200 lbs. I’m a woman. I feel self conscious in long evening wear but love dressing up. So I wear a stylish top and black palazzo pants with strappy black sandals. My husband wears a suit and tie. That to me is formal enough for “formal night”! Yes or no? Yes I think that’s fine, simply put you make an effort, I’m not a snob and I come from a working class background but I feel you should make an effort to smarten up a little for your evening meal onboard a ship even on the casual nights. I also find it strange that P&O objected to full Scottish dress on a formal night. P&O certainly found it acceptable on the four voyages we had (admittedly the last was the early 1990s). We see Scottish dress on Cunard and they are the most formal of lines. I agree with others who say if you don’t like dressing up, then go on one of the casual cruise lines or eat in the cafeteria. One US-based cruise line said that formal nights meant that ripped blue jeans and baseball caps could not be worn in the dining rooms. That’s a dumb-downed definition of formal if there ever was one. Since we retired we don’t get a chance to dress up very often, so a crossing or cruise on Cunard is a chance to live differently. dressing up is good for me as i do not have to think what to wear unlike my good wife but always looks great. I think formal nights are very special & should be adhered to. To see the whole ship dressed up looks wonderful & people tend to walk around looking proud & beautiful! It’s what cruising is all about really, how many opportunities do we get in everyday life to wear our best outfits?? There are now many lines that are casual, so if that’s what suits then use those…but please if you opt for a ship with different dress codes it looks very disrespectful not to join in. If the ship has a dress code then people should observe it, it’s not as if it’s a surprise that you didn’t know about when you booked. On an MSC cruise on a gala night I followed in an Italian in a shell suit and trainers, someone else on a nearby table had combat shorts and a T shirt, dressed in my tux with bow tie I felt decidedly overdressed, they apparently view it as a suggested dress code so it’s not mandatory. You wouldn’t go into a restaurant at home with that level of service dressed scruffily and I think it is a matter of respect to the waiting staff and fellow guests that you dress appropriately. I love dressing up but if you don’t like to get dressed up then I think you should go on ships who have a more relaxed dress code. If you don’t want to dress for formal nights, that’s your perogative. HOWEVER, the dining room should insist on it. There are many other venues for those who choose to wear something else, but I for one do not want to eat with unwashed persons dressed in shorts, t-shirts and flip-flops. Save that for daytime or the buffet. As an example when on a P&O cruise The staff did not want to allow me back into the dining room after visiting the bathromm because I was nor wearing a jacket which was in the dining room where I was eating. Also once again on P&O I was challenged at the dining room because I was wearing full scottish dress and I was told this was not formal wear. very P&O cruise I have been on. I agree Moira! Scottish dress is formal! and have seen many dressed like that and they look stunning.